The ancient Greeks hard-wired a tragic sensibility into their culture. By looking disaster squarely in the face, by understanding just how badly things could spiral out of control, they sought to create a communal sense of responsibility and courageto spur citizens and their leaders to take the difficult actions necessary to avert such a fate. Today, after more than seventy years of great-power peace and a quarter-century of unrivaled global leadership, Americans have lost their sense of tragedy. They have forgotten that the descent into violence and war has been all too common throughout human history. This amnesia has become most pronounced just as Americans and the global order they created are coming under graver threat than at any time in decades. In a forceful argument that brims with historical sensibility and policy insights, two distinguished historians argue that a tragic sensibility is necessary if America and its allies are to address the dangers that menace the international order today. Tragedy may be commonplace, Brands and Edel argue, but it is not inevitableso long as we regain an appreciation of the world's tragic nature before it is too late. 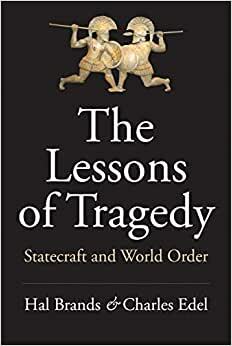 Start reading The Lessons of Tragedy: Statecraft and World Order on your Kindle in under a minute. Hal Brands is the Henry Kissinger Distinguished Professor of Global Affairs in the Johns Hopkins School of Advanced International Studies and a senior fellow at the Center for Strategic and Budgetary Assessments. Charles Edel is a senior fellow at the United States Studies Centre at the University of Sydney and previously served on the U.S. secretary of state's policy planning staff. 5.0 out of 5 starsArrived quickly. Make certain you have your glasses handy. My wife wanted to order this book the most so she is reading it first. She is impressed with its "intellectual" presentation as she put it. But she believes it makes sense.